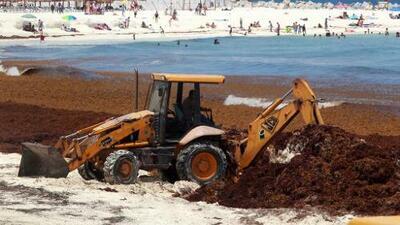 What is causing the invasion of brown sargassum seaweed on our beaches? Global warming fosters the growth of algae in the ocean, but scientists still lack an explanation as to why so much of it is invading formerly pristine beaches. MAYAN RIVIERA, Mexico - Our feverish oceans are spitting out hurricanes. They are spewing invasive seaweed onto our beaches. Beneath the water, the coral is turning pale. Something is wrong, very wrong. And the seas are trying to tell us something. Two or three times a year my family and I travel to a wonderful area here between Cancún and Tulúm, in the state of Quintana Roo. Its my favorite beach; the sand is smooth and white, the waters a deep turquoise. Every time Im here, I get the sensation that Im in the best place in the world. But during the last few visits Ive seen a drastic change: The beach is often covered with brown sargassum seaweed. The tractor driver had a mammoth and impossible task. Every load of seaweed he moved was like removing a grain of sugar from a sugar bowl. An army of workers stood nearby in the knee-deep water, fishing out the seaweed with nets before it could reach the beach. Others were erasing the tractors tracks with a broom. This cosmetic surgery takes place every day all along this coast, and its been happening for years. The first signs that the seaweed was a threat to the beaches and, thus, to tourism appeared in 2011; the invasion intensified around 2015. Officials kept saying it was an atypical phenomenon, but these days there can be no doubt that nature here has undergone a dramatic change. In 2013, scientists from Texas A&M University at Galveston launched the Sargassum Early Advisory System (SEAS), one of the best tracking systems in the Gulf of Mexico. Just as it does in the Caribbean, millions of tons of sargassum wash up on the Texas coast every year. Unfortunately, the SEAS system provides only an eight-day forecast. Why is this happening now? Global warming, undoubtedly, fosters the growth of algae in the ocean. Sargassum can double in size every 18 days, and a warm sea is a perfect breeding ground. However, scientists still lack an explanation as to why so much of it is invading formerly pristine beaches. PS: On my flight from Cancún back to Miami, I spotted islands of sargassum, spreading out menacingly across the ocean like an oil spill. After landing I saw the front page of the Miami Herald, which featured a terrifying story about the red tide (another algae, K. brevis, which darkens the sea and has killed thousands of fish along Floridas coasts). The seas are truly trying to tell us something.